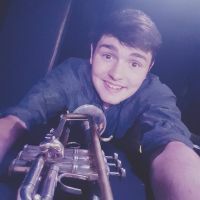 Additional Info: I have studied since 2014, classical and jazz trumpet with a scholarship in performance at Trinity college of music under the direction of Bob Farley and Steve Waterman. In 2014 I performed principle trumpet for the Trinity College wind sinfonia and in the concert orchestra in 2015. Previous to this I played lead trumpet for the Merton Music Foundation jazz orchestra and concert band, from 2012-2014 performing concerts including at the Wimbledon tennis championships, the Hideaway jazz club and The Royal Albert Hall. I was principle trumpet for the under 12's National Children's orchestra in 2007 and a member of the under 13's orchestra in 2008. I have performed with the touring show 'Let's hang on' on different occasions since 2015. I have also taking part in many shows, including ' 9 to 5', 'Les Miserables' and 'Guys and Dolls' to name a few over the past years. I have also recorded with various indie bands, such as Fella and The Yacht Club, as well as being part of The Epic Renditions series recordings for YouTube.